Something else I like is the grand sweep of history. 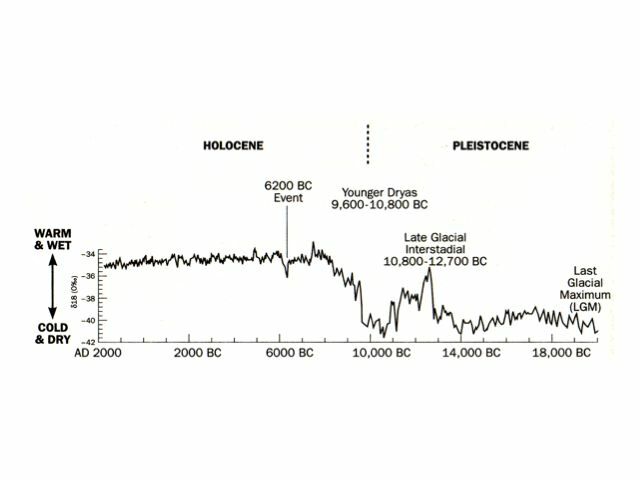 This graph shows how warm and wet it has been since the beginning of modern humanity. At the right, it was very cold. Europe was a wasteland. There’s a blip 14,000 years ago where Europe gets warm and wet and suddenly there are villages and trade routes and really developed social systems. Then it gets cold for a 1,000 years – out of nowhere, the Younger Dryas – it was the North American ice sheets collapsing – and Europe is a wasteland again. Back to being hunter gatherers, nascent societies gone, until it gets warm again. Like many things across lives, civilisation is a vehicle with two gears: progress or catastrophe. But progress always has in it the seeds of catastrophe, and catastrophe always prompts progress, you know? Here’s one example. In 3,114 BC, it looks like some catastrophic event hit the earth. Maybe it was a comet. There must have been something climactic because in the same year you see multiple civilisations around the world suddenly take off. There must have been the same external pressure worldwide to make them all coalesce. The Mayan calendar starts in August that year. The kingdoms of Egypt got together around then. Construction of Stonehenge began. The Patagonians kicked off then too. We don’t know much about them, only some fragments from Rodrigo de Isla, a Spanish conquistador who crossed the Patagonian plateau in 1535. Or rather, he didn’t quite cross it: his men mutinied on the way back and killed him. Anyway, it appears de Isla was there around the same time as the Patagonian collapse, although he didn’t write about it. It seems to have happened just after.